This church might not have taken as long to complete as the work-in-progress that is the Sagrada Familia, but it still took a generous 59 years. Enric Sagnier began construction on the church in 1902 with a neo-Gothic style. 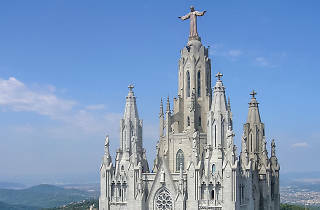 White stones make up towering turrets that reach for the clouds, and it's capped with a bronzed statue of Jesus. Inside the church, stained-glass windows let in enough light to brighten the wooden pews and mosaic depictions of Jesus' life on the walls inside. A lift takes you up to the top of the church to give you the fantastic views you travelled so far to see. 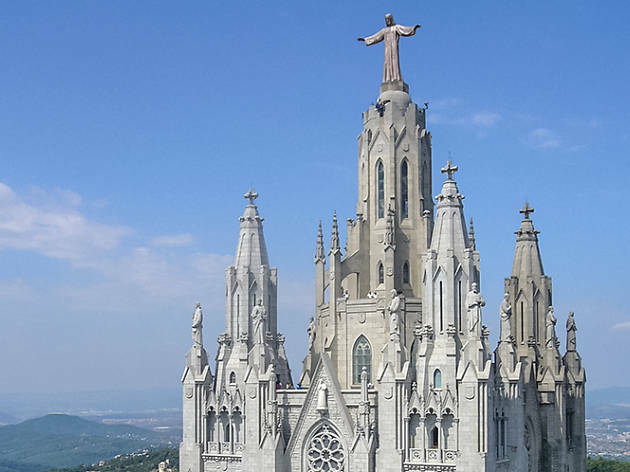 The church is at the highest point of Tibidabo mountain, and the windows of the four towers feature the words 'Tibi dabo' (Latin for 'I'll give you'). After visiting the church, stop by the amusement park and enjoy the Ferris wheel that will take you to new heights, as well as the other rides that are fun for children and their grown-ups. Prices: Basilica and crypt: free. Lift: €3.